Hemel Town FC cruised through to the second round of the Herts Charity Cup as they beat Hitchin Town 2-0 at Top Field on Monday night. It was an assured display from a young Hemel side in their first competitive match of the season, with goals in either half from Willy Gnahore and Jamal Lowe. Hitchin worked their socks off; they are well drilled and well organised so it is always important to get the first goal when you come here. To their credit, Hitchin made it a competitive affair, but Hemel were always in control and got the job done in impressive style ahead of Saturday’s National League South opener against Dartford. 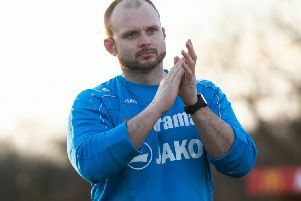 Speaking after the game, Tudors boss Dean Brennan said: “At this point the results don’t really matter if I’m being honest, it’s all about fitness and getting match time into the players. “Hitchin worked their socks off; they are well drilled and well organised so it is always important to get the first goal when you come here. Hemel started the game well, with Lowe and Gnahore looking lively from the outset. It was Lowe who came closest to breaking the deadlock for the Tudors in the early exchanges, breaking from a Hitchin corner but failing to keep his shot down after carrying the ball half the length of the pitch. Hitchin were matching their visitors in terms of workrate and endeavour, but it was Hemel who made the breakthrough in the 39th minute when Mo Shariff and Lowe combined to set up former Nottingham Forest youngster Gnahore to drill home smartly with the outside of his foot from 10 yards. It was more of the same in the second half, with Hemel looking lively in attack and keeper Jamie Head largely a spectator at the other end. The Hemel keeper did have one nervous moment when he saw his kick charged down by Hitchin forward Matt Lench, but Head was relieved to see the ball roll inches wide of the open goal. Hemel used the game to give a couple of the club’s academy youngsters a taste of first team action, with Ben Johnson and Joe Findlay introduced from the bench, and it was Dean Brennan’s side who went on to wrap up the win late on. Lowe broke forward on the left and played the ball to Rheo Josephs, who in turn teed up man of the match Lowe on the edge of the box. The forward dropped his shoulder and took a touch, before delivering a crisp strike into the corner of the net to seal the win.